Prescriptive medication and wellness supplements come in a variety of shapes and sizes, with a multitude of doses for the required application. 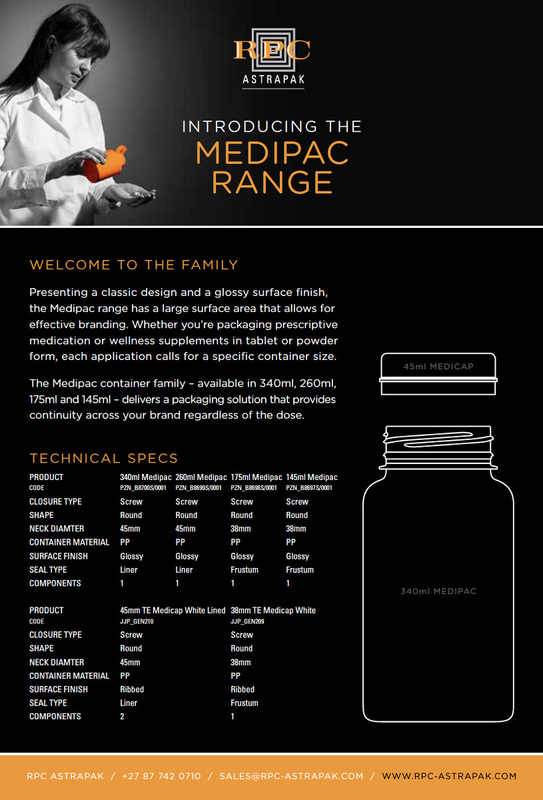 Each application calls for a specific container size and the Medipac container family range – available in 340ml, 260ml, 175ml and 145ml – delivers a packaging solution and provides continuity across your brand regardless of the dose. RPC Astrapak Plastop has manufactured these robust containers with the specific purpose of packaging tablets, capsules and supplements, while adhering to strict healthcare standards during production. Polypropylene (PP) is a material well-recognised for a variety of beneficial properties. Products utilising PP are lightweight, yet robust, impact resistant, long-lasting, and can be engineered into a vast range of packaging that protects its contents, particularly for medication and supplements. The bottle as well as the closure are manufactured from PP, and the closure has the option of a liner to further protect the product from degradation during transport and to preserve the contents, while the screw-on closure has a tamper-evident sealing band. As well as featuring a classic, rounded shape and a glossy surface finish, the Medipac family has a large surface area that allows for effective branding. While this is a traditional design, customers may add decorative personality to their product in choosing between screen-printing and self-adhesive labels. The 100% recyclability of PP is a further advantageous feature of this family range; PP is widely recycled and can be transformed into a variety of products, such as recycled plastic spatulas and cutting boards, storage bins and shipping pallets.